Calf Crag is the highest point on the ridge that begins at Helm Crag and that runs along the northern side of Far Easedale. Calf Crag is the point at which the ridge gains both height and width - from Helm Crag to Moment Crag the ridge is steep sided, with a fairly narrow top and a height of around 1,350ft. At Calf Crag we climb up quite steeply onto a wider plateau, gaining another 400ft. 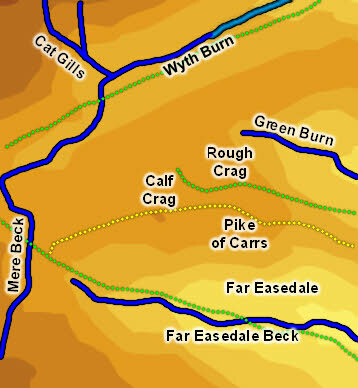 Calf Crag sits between three major valleys. To the south is Far Easedale. To the north is the Wythburn Valley, which also curves around the western end of the fell. Between the two is Greenburn Bottom, which sits between the Helm Crag ridge and Steel Fell, with Calf Crag almost at the head of the valley. The most common route to the top of Calf Crag is along the ridge from Helm Crag to the top of Far Easedale. Elsewhere the south face is too rough for ascents but to the north the fell slopes gently down to Wythburn Head and can easily be reached from the path along that valley. To the east a footpath comes up from Greenburn Bottom, reaching the ridge just to the east of the start of the climb from Moment Crag to Pike of Carrs. Our ascent of Helm Crag continues along the ridge to Calf Crag before returning via Far Easedale. The top of Calf Crag is a large gently sloping plateau dropping down to the north. The summit itself is on a small rocky outcropping that sits on top of this plateau (the original Calf Crag is the southern face of this final summit). Far Easedale Beck forms the southern boundary of the fell, running past its south face. The western boundary is formed by Mere Beck, which rises on High Raise and flows south past the western end of Calf Crag. This flows into Wyth Burn, which forms the northern boundary. In the north-east a ridge links Calf Crag to Steel Fell. Nameless becks run down both sides of this ridge from about its lowest point, but don't form clear boundaries. Green Burn rises on the eastern slopes of Calf Crag and flows east between the Steel Fell and Helm Crag ridges. There is no clear dividing line between Calf Crag and Gibson Knott, the next named summit on the ridge, and no dividing streams. Calf Crag has two nameless tarns - one to the west of the summit in Brownrigg Moss and a second on the ridge leading towards Steel Fell.